I recently had the pleasure to attend a lecture by Randy Beatty (who has been affiliated with the International Atomic Energy Agency [IAEA] for some time), focusing upon the IAEA's perspective on Fukushima, particularly in terms of our current understanding of the sequence of events (which is still evolving) as well as the IAEA's interactions with the government of Japan and TEPCO (the owner of the Fukushima reactors). Below is a summary of some of the major topics covered, including a more detailed reconstruction of the accident sequence (and particular, both the relatively small timeframe in which most of the damage occurred) as well as a better understanding of how other, secondary complications such as the hydrogen explosions came about. Finally, more precise estimates of the quantities of radiation released and the direction of its spread shed some light on how many were affected and the relative appropriateness of certain evacuation precautions. 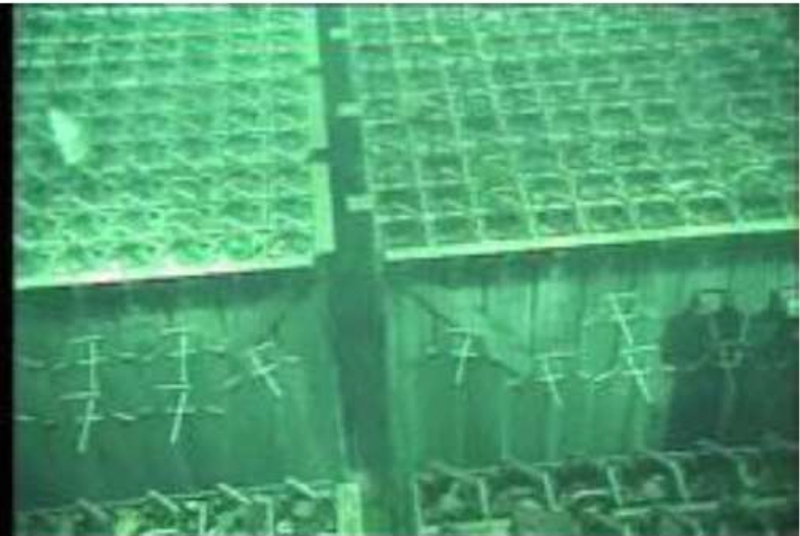 Water inside the reactors began to boil away as it heated up. As water boiled away, the fuel rods heated up. As the fuel rods heated up, the cladding failed, releasing radioactive fission product gasses. The fuel is also believed to have partially melted when it became uncovered by water, releasing more radioactive materials from the core. Cooling was restored by injecting seawater into the reactors to quench the decay heat from the rods and prevent further melting. What has been perhaps less well-understood are issues such as how much fuel melted, how long the core was not covered by water, and the extent of the radioactive release. A great deal of research work is being conducted at the national laboratories presently to reconstruct what was going on inside the reactors in the first few hours (immediately after the rectors were shut down) in order to characterize what exactly happened; thus our understanding on this point will continue to evolve over the next several years. One of the key issues that seems relevant in much of the accident sequence is the relative speed at which events progressed. While most of the world witnessed the event as a long, drawn-out drama, much of the damage had already occurred in the first few days (and in particular, the several hours the reactors were without power before seawater injection was applied). Courtesy of Randy's presentation, here is a good timeline of what occurred at each reactor. The fuel was estimated to have been uncovered for about 2.5 hours. Water injection was estimated to have stopped (due to the loss of power) for 14 hours and 9 minutes. March 14, around 6:00 PM: Fuel exposed, core melt begins. Approximately 30% of the core of Unit 2 was estimated to have been exposed in the 6 hours and 29 minutes in which cooling was unavailable. The fuel thus appears to have been exposed from approximately 1.5 hours, with water injection having been unavailable for about 7 hours. Several issues are clear from this timeline of events. First, despite an earthquake beyond the design basis for the reactors, emergency systems largely functioned as intended. Were the backup power systems not destroyed by the following tsunami, it is likely the incident would have largely been contained without incident; indeed, it was the "total station blackout" condition which was the root cause of the radioactive releases (i.e., by allowing the fuel to overheat). In this sense, one criticism made of the Japanese government was in its initial reluctance to accept assistance from outside agents such as the United States, which had offered to airlift in replacement generators when the tsunami destroyed the initial generators. Whether this initial refusal was a face-saving measure or something else remains to be seen, but quite clearly this exacerbated the issue. Backup systems such as battery backups appear to have mitigated some of the damage, particularly in the case of Unit 3, where Japanese officials report that the battery backups appear to have lasted approximately 50% longer than their design life (around 18 hours, compared to a design life of 12). Most stark here is the relatively short time period in which most of the damage occurred - in most cases, the fuel was exposed for only a few hours (up to about 6.5 hours for Unit 2, which experienced the most severe fuel damage). Likewise, following the complete loss of power, it took only a few hours for the core to become uncovered due to water boiling from the core. Complicating the situation at Unit 2 may have been the hydrogen explosion which occurred in the suppression pool (the donut-shaped cavity at the bottom of the reactor, designed to condense steam from the reactor to recirculate coolant and draw off heat). This appears to have accelerated the damage at Unit 2, explaining the extent of damage seen there. Finally, most of the radioactive release appears to have occurred within the first three days, following the uncovering of the fuel in the cores of Units 1-3. Due to extremely difficult conditions at the reactors from the earthquake and tsunami (i.e., extreme devastation and an overall lack of electricity, with no instrumentation information from inside the reactor buildings), the overall extent and significance of radioactive releases would not be ascertained until later. Unlike Units 1-3, Unit 4 was in a scheduled outage for refueling and maintenance prior to the earthquake. 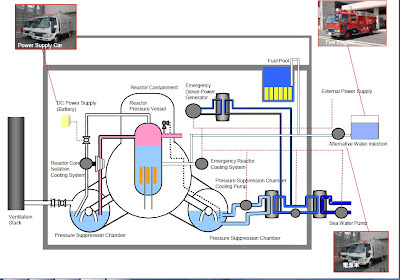 Rather, Unit 4's spent fuel pool contained a mixture of older and newer, more recently-ejected fuel (which is hotter, due to a greater amount of short-lived fission products remaining in the fuel). The loss of power to Unit 4 produced a similar situation to Units 1-3; even though the fission reaction is "off" in the fuel, short-lived radioactive materials in the fuel continues to decay, generating heat. This heat must be removed from the fuel, thus fuel is stored in deep pools of water, generally kept around room temperature and pressure. (In other words, spent fuel pools are quite similar to very deep swimming pools for spent fuel rods). The water serves a dual purpose; first, the water "wicks" away heat from the rods, keeping them cool, and second the water provides an effective shield from radiation emitted by the spent fuel. Heat in the cooling pool must be removed, just as is the case of reactors - thus cooling pumps exist to circulate the cooling water in order to maintain the temperature of the pool (and thus the spent fuel). Thus, should these pumps be disabled (due to a loss of power), this water will begin to heat up as well, eventually boiling. However, spent fuel in the pools is generally much cooler than that from fuel in reactors which have just shut down - recall that decay heat falls off exponentially with time, meaning that after a few weeks, the heat emitted by spent fuel rods is much, much lower than that of a reactor which was just shut down. Thus, the loss of coolant would be much slower than that of Units 1-3. During the crisis, some speculated based upon limited data (little to no actual instrument data from the pool was available due to the lack of power) that the water levels have precipitously dropped; NRC Chairman Gregory Jaczko even (now infamously) speculated that the pools had gone "completely dry." However, recent images taken of the spent fuel in Unit 4 by the IAEA indicate that the fuel appears to be intact and undamaged; thus an uncovering of the fuel in Unit 4 appears to be extremely unlikely. In addition, the IAEA has tested for radioactive isotope concentrations in the water within Unit 4's spent fuel pool; in the event that the fuel became uncovered or fuel melted, telltale isotopes would be present to indicate this. Current analysis has failed to find these, further indicating that it is unlikely fuel was damaged at Unit 4. Finally, experts familiar with fuel chemistry indicate that radioactive ruthenium (a chemical in the lanthanide family and a common fission product which tends to travel with water) would have been present outside Unit 4 had fuel melt occurred, which has not been found. However, the drop in the water level which occurred in Unit 4 is still an unknown (due to the lack of instrument measurements inside the building from the power outage) and difficult to determine; experts are currently attempting to perform back-calculations to estimate this. Thus, the hydrogen explosion at Unit 4 lead some (such as Jaczko) to speculate that the spent fuel pool had gone "completely dry." However, no signs of fuel damage were observed, indicating that zirconium hydriding from spent fuel rods in Unit 4's pools was extremely unlikely. Therefore, where did the hydrogen in Unit 4 come from? The IAEA believes that hydrogen may have been vented from Unit 3 to Unit 4 through a "standby gas treatment system" exhaust pipe; this exhaust tube had joint inputs from Units 3 and 4, thus conceivably allowing hydrogen to travel from Unit 3 (where it was being produced following the core becoming uncovered) to Unit 4 (where it subsequently ignited and exploded). Thanks to my colleague Alan's ability to read and speak Japanese, this blog has been following dose data around the plant and surrounding area from early on after the accident. However, the IAEA has helpfully compiled a map of further measurements which were taken by ground stations and measurements by aircraft. Air measurements conducted around the area of the plants indicate that much of the plume containing radioactive materials traveled northwest (i.e., due to wind); doses outside the main plume spread to the northwest were found to be relatively negligible. Likewise, with the exception of the plume "tail" in the northwest, nearly all of the elevated dose rates in air were concentrated within a radius of 30 km from the plant, calling into question the logic of NRC Chairman Jazcko's order for Americans within 50 miles (around 80 km) to evacuate. 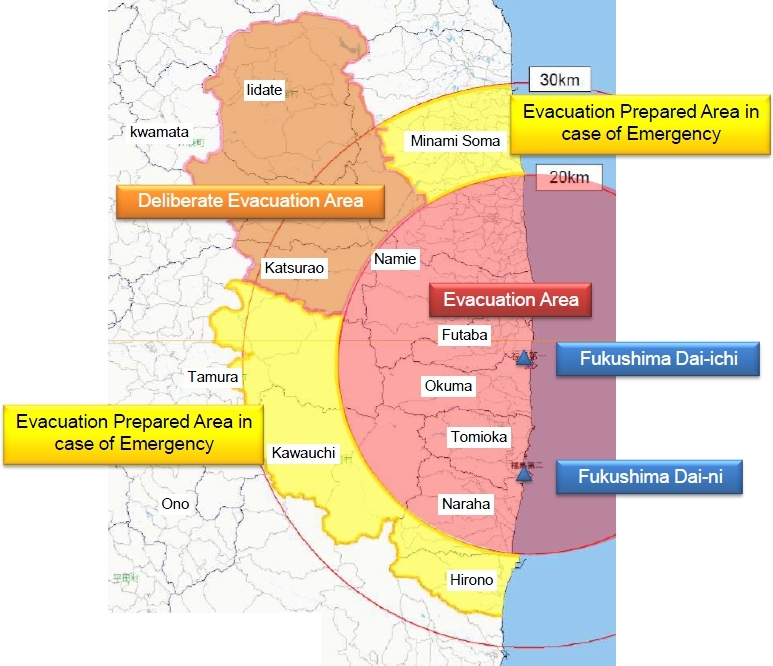 As is clear from the evacuation zone map, the Japanese evacuation order of 20 km with a deliberate evacuation of Iidate and Katsurao prefectures appears to be based upon a sound evaluation of the measured exposure rates. Additional precautions in place (e.g., staying indoors and prophylactic measures such as distributing potassium iodine tablets) were implemented in areas within the 30 km radius. Approximately 78,000 people were evacuated from the evacuation area (20 km), with an additional 10,000 evacuated from the "deliberate evacuation area" to the northwest (a smaller number due to the relatively low population density in these areas). Residents in the "Evacuation prepared areas" were informed to stay indoors and prepare for a potential evacuation order in the event of further emergencies (e.g., large measured increases in the exposure rate). 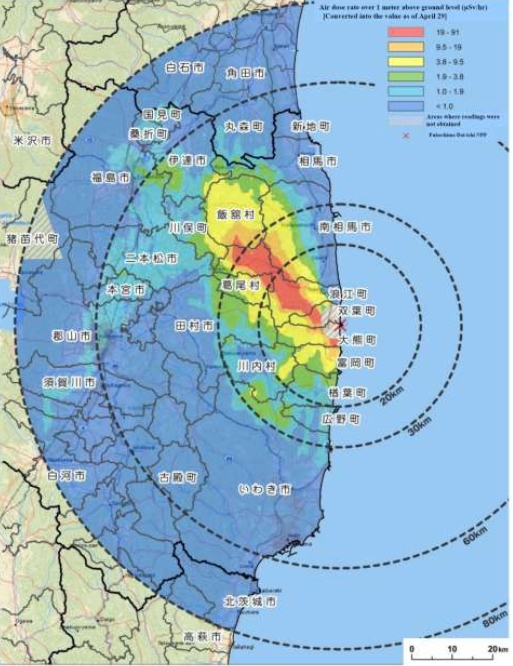 As a precautionary measure, potassium iodine (KI) tablets were distributed to residents within 50 km of Fukushima prefecture; 1.51 million potassium iodine pills were distributed to approximately 750,000 residents , while 6,100 grams of KI powder was distributed to 120,000-180,000 individuals. A point which must be emphasized again in evacuation decisions such as this is in the relative risk averted through evacuation versus the human costs imposed, particularly in light of an epic natural disaster such as this, with tens of thousands dead or missing and over a hundred thousand displaced. Overly conservative evacuations based upon marginal risks (i.e., outside 20-30 km) place an additional burden upon already strained emergency resources (shelters, medical facilities, etc.) while giving little additional benefit. Even under the best of circumstances (which clearly was far from the case here), broad evacuation orders can result in tremendous hardship; the gains from evacuation must therefore be balanced against the additional burdens imposed. Based upon calculations made of the measured activity outside the reactors, the IAEA made an estimate of the relative fraction of material released from each core. Nearly all noble fission product gasses (such as xenon and krypton) were released; however, these are of negligible concern, given the fact that they are chemically inert. Approximately 1% of radioactive iodine was released from Unit 1, with about 0.4 to 0.7% of the iodine released from Units 2 and 3. Finally, for other species (including cesium), less than 1% was determined to have been released into the environment; for Units 2 and 3, this was determined to be around 0.3 to 0.6% of the activity in the core. One rather persistent rumor among media outlets and particular blogs was reports of transuranic elements (i.e., plutonium and other elements above uranium on the periodic table) being found in soil samples outside the plant, indicating a "blowout" of materials from the core similar to Chernobyl. (in the case of Chernobyl, the resulting fire lofted much of the fuel materials into the air, scattering them much farther than they would have otherwise traveled and allowing heavier species, such as plutonium, to escape). The IAEA did find reports of small amounts of transuranic materials found near the plants from ground monitoring stations and groundwater samples, however these measurements were found to be inconsistent, with little sustained evidence. One difficulty is establishing a source for these materials, which are not necessarily from the plant itself, given the widespread dispersal of radioactive elements around the globe during the time of above-ground atomic testing. Testing for aspects such as the relative abundance of different isotopic species may help to determine the source (i.e., whether the material is older, such as from bomb testing, or newer), however given the relatively scarce amounts found, it has been difficult to establish a source for these materials, given that they conceivably may have precipitated from anywhere in the area. Estimating doses for workers was found to be extremely challenging, due both to the lack of instruments at the facility (from the power outage) as well as the flooding, which either swept away or ruined many of the personal dosimetry meters worn by workers or stored at the plants. Of 7800 workers measured, the average worker dose was about 7.7 microSv (well short of the yearly dose limit); 30 were found to have doses greater than 100 milliSv, while 2 workers were found to have equivalent doses to the skin of about 2-3 Sv (due to contact with radioactive water in flooded buildings, causing minor skin burns similar to a sunburn). Estimation of doses received by the public was measured primarily by the level of surface contamination (i.e., number of radioactive counts per minute). Most of the 195,354 individuals screened were found to be below the 100,000 counts per minute limit; of those who were found to be above this limit, most of these individuals had residual contamination on clothing only and were cleared after changing clothes and vigorously washing their skin. One question which came up was in the choice (and chronology) of the accident classification of the Fukushima incident, initially placed as a "3" on the INES scale and moved to a "4," then a "5" (similar to Three Mile Island) and then finally upgraded to a "7" (similar to Chernobyl). 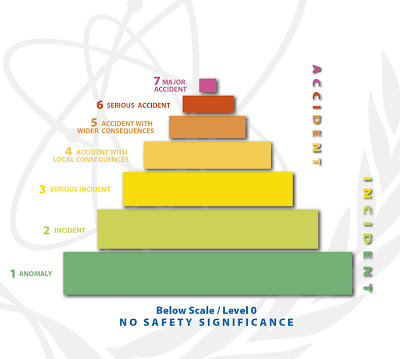 With respect to the accident classification, the choice of a classification of "7" (the most severe accident category classification) seems somewhat confusing in light of the limited consequences of Fukushima compared to Chernobyl (whose overall total radioactive releases were nearly ten times that of Fukushima). However, the accident classification itself was based upon the total activity of materials released (e.g., very short-lived materials, while quickly going away, will have a higher relative activity rate), including those released into the ocean (where the effect would be relatively dilute). Thus, the application of a "7" rating was a strictly mathematical decision, based on the threshold value for total release. On the other hand, the sequence of classifications was a more delicate political matter. 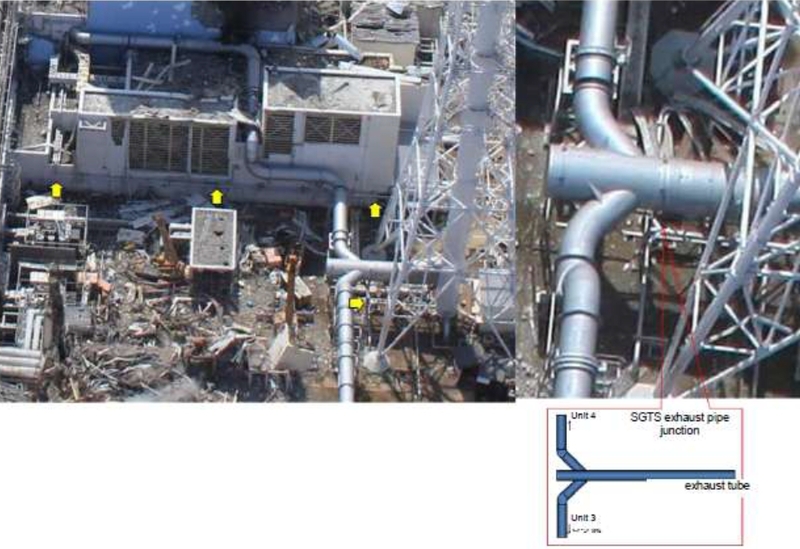 As evidence surfaced of the situation growing more severe, TEPCO and the Japanese government were continually required to update the accident classifications. (Likewise, there appeared to be a certain reluctance on the part of TEPCO and others to disclose the full significance of the incident). As the situation progressed, it was clear that TEPCO and others would simply need to concede the severity of the conditions, re-classifying the accident as a "7" in order to "get ahead" of the situation, rather than being seen as continually dissembling[?] and delaying. In as much, while the final classification itself was based upon total measurements, in the IAEA's view the chronology of how these ratings were assigned as the accident unfolded were influenced by concerns over public perception. Much of what will occur in the aftermath of Fukushima will be to determine how nuclear operators can plan for and respond better to similar circumstances in the future. Much of the problems encountered at Fukushima came from the total loss of power at the facilities, followed by the destruction of the backup diesel generator units in the tsunami (a condition known as "station blackout," the worst possible circumstance which can occur at a plant). Thus, many of the IAEA's recommendations fall under these categories. In addition to recommending that operators and plant designers harden facilities against earthquakes and floods, a key area of focus will be in ensuring that reliable backup supplies of power can be maintained in order to operate cooling pumps following an unexpected plant shutdown. This includes hardening backup generators (placing them out of reach of flood waters) and making dedicate contingency plans such as mobile power vehicles to supply power in the case of a generator failure. Other factors include features such as means to mitigate hydrogen production in circumstances such as this, through the installation of hydrogen "recombiners" (which steadily burn hydrogen rather than allow it to accumulate) and dedicated "blow-out" panels to allow for emergency venting of hydrogen from the outer containment buildings. It was noted that over 300 metric tons of hydrogen was produced in the three reactor units (in other words, over 300,000 kilograms), thus leading to the rather dramatic hydrogen explosions witnessed. Other recommendations focus upon measures for emergency response, such as procedures for handling nuclear emergencies. A particular complication in the case of Japan was in the widespread devastation beyond the scope of the plants themselves; many workers at the plant were uncertain about the safety of their homes and families, leading to confusion and initial difficulties in maintaining sufficient staff levels to respond to the emergency at the plants. Finally, the IAEA recommends regulatory reforms such as instilling a more thorough safety culture and reinforcing the regulatory safety infrastructure by fostering a greater separation of regulators and utilities, which have been frequently criticized for enjoying too cozy of a relationship in Japan. An additional criticism made was in that preservation of economic assets (e.g., the reactors) was potentially prioritized above safety in the early stages of the response, delaying such measures such as seawater injection (an emergency measure to cool the core which almost certainly would mean a total economic loss for the reactor unit). It likewise is useful to place events like this in context; while it is clear that Fukushima was an extremely serious event in hindsight (it would now appear to be far more serious than Three Mile Island, although less serious than Chernobyl), the consequences must be compared to the risks encountered by the available alternatives. For example, one consequence of the earthquake was the destruction of a hydroelectric dam, destroying over a thousand homes. Liquefied natural gas facilities were also destroyed in the earthquake, leading to further casualties. By comparison, the only person who has died as a result of the Fukushima disaster was not even killed by a radioactive release, but rather was killed by a falling crane. Risk is an unfortunate fact of life, and in particular of energy production. This applies to all forms of energy production, not just nuclear - each form of energy production comes with equivalent risks and trade-offs, including economics, pollution (for example, the radioactive releases from coal plants in smokestacks are far higher than that of nuclear plants), land utilization (diffuse energy sources such as solar and wind consume enormous land footprints), etc. There is, alas, no "free lunch" when it comes to energy. The best that we can hope for is to understand and minimize risks by constantly striving for better and safer designs and better ways of responding to accidents. In particular, it is worth noting that the Fukushima plants were of a prior vintage - built in the 1960's and nearing retirement. 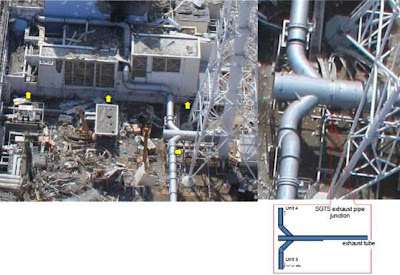 Newer plants built at Fukushima Dai-ini did not suffer nearly the same consequences as those at Dai-ichi, in part due to enhanced safety features within the designs. Likewise, plant designs being proposed today take advantage of decades of engineering experience, including advances in technology (particularly in advanced computing - perhaps the most amazing thing about much of the existing nuclear fleet is that it was designed with pencils and slide-rules...). New designs such as small modular reactors promise further enhancements in safety. Ultimately, safety will be an ongoing challenge, one not entirely technical in nature. After Three Mile Island, one of the most radical changes to the U.S. nuclear industry was a focus on human factors - particularly looking at aspects such as instruments in the control room, operator training, and instilling a safety culture. Similar lessons may ultimately have to be internalized in the case of Japan. It has often been said, "Experience is the harshest teacher, and her lessons the most expensive." For the Japanese, no doubt this case is little different. A special thanks to Randy Beatty and the IAEA for both presenting and making these resources available to me.